"Is there a doctor available?" is a question that is occasionally heard when life-threatening emergencies occur in sports or injuries occur during activities. Now shift the playing field from dryland to the open water. The question, "Is a doctor available?" now becomes even more critical. Few training swims and not all open water events have a licensed medical professional on site or easily available. Many times, most times, there is not anyone around who has studied emergency medicine. An emergency call may be made, but it is in the early stages where first responders - or friends or swim buddies - can have the most positive and helpful impact. This is where Nuala Moore comes into play. "The World Extreme Medicine is very exciting for me," says the 49-year-old Irish ice swimmer from Dingle who often is seen helping out and advising swimmers in the rewarming tents and saunas around the world's winter swimming and ice swimming competitions. Her new book - Insight Into The World Of Ice Swimming - has already been distributed to 18 countries* after the first month. "There is such a huge interest and if I can influence one person and create the ethos that we need to learn more about ice swimming and about the post-swim recovery, then I’ve done a good job. I would love for team members to be aware of what they are signing up for when they team up for an ice swim to assist post-swim recovery. Many have never experienced the post-swim recovery and it can be scary. It's a supreme sport - but risk is real." Moore has been invited as a Guest Lecturer to the World Extreme Medicine program. World Extreme Medicine (formerly called Expedition & Wilderness Medicine) is the world's leading provider of expedition, wilderness and remote medicine training courses for medical professionals. It offers programs designed to provide medics - and others - with the expert knowledge and practical skills they need to become valuable members of an expedition or a remote medical team. The courses are offered both in the UK and abroad with locations carefully chosen to enhance learning opportunities in the field and enrich the experience for all those taking part. World Extreme Medicine founder Mark Hannaford explains who teaches the courses, "Academic qualifications are all well and good, but in order to inspire others and prepare them for life as an expedition medic, nothing beats expedition experience. We are therefore proud to have drawn together a medical and teaching faculty whose expedition experience is unsurpassed, ranging from Antarctica to Namibia, China to Chile. We are grateful to them for sharing their inspiring stories, hard-won knowledge and proven-in-the-field techniques and skills with such generosity, passion and enthusiasm." Our speakers are an eclectic and interesting bunch [who teach] courses are suitable for doctors, students, wilderness EMTs, first responders and nurses, and for individuals providing medical cover in remote or inhospitable environments. While you don't need an advanced medical degree to take an Expedition or Wilderness Medicine Course, the training is pitched at participants with a strong medical background and a keen interest in wilderness and remote medicine." Moore will share her knowledge and know-how on topics covering a wide range - that may be encountered by a swimmer, a pilot, a coach or crew members on any open water swim. When Moore and her colleagues first started going to Russia for ice swims, she always developed a plan for recovery every time. "Being a PADI Diving Professional, the ethos of teaching, the ethos of safety, and mostly ethos of briefing and debriefing after every dive was my normal accepted way of working. I have always tried to apply this to ice swimming. Ice swimming is an amazing sport. Every area of the ‘extreme’ has its rules. As more and more swimmers are joining to the sport, the risks increase based on the numbers, time and temperature." In her book and in her course, Moore will focus on cold water shock, cold water incapacitation, post-rescue collapse, recovery areas and processes. For more information about World Extreme Medicine and its new Ocean Medicine Training course, contact Nuala Moore at nualamooreswim@gmail.com or click here for its first 4-day offering in Plymouth, England. World Extreme Medicine has begun to offer Ocean Medicine, a specialized marine environment medical training. The 4-day course is designed for self-sufficient individuals, teams and medics, and spans a comprehensive array of marine activities in a rapidly growing world of adventure sports and travel, including open water swimming disciplines. The course gives participants an understanding of conditions likely to occur whilst on a marine based expedition. During the course delegates will train and be assessed for the Royal Yachting Association (RYA) Level 2 Powerboat Handling qualification. Ocean Medicine is aimed at medical and healthcare professionals interested in supporting marine-based challenges, sporting events and expeditions. The course has been designed to cater for non-medics with a significant interest in marine/ocean events. * Catherine Buckland, a commercial diver and dive instructor. Spending the last decade working in the marine industry, either working as a diver or diver medic, teaching diving or power boating among other marine based qualifications. This work is varied and takes her to some challenging environments where all the skills and experience need to be put in place. * Nuala Moore, a swimmer on the Bering Strait Relay, a multiple medal winner at the World Ice Swimming World Championships. 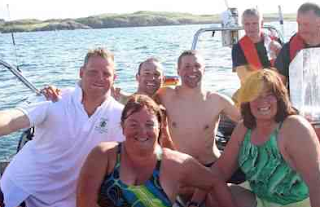 In 2006, she was one of six swimmers to swim around the coast of Ireland in a relay, the first swim of over 1300 km around the coast. 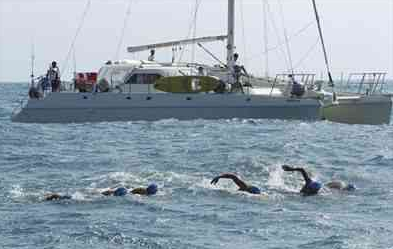 In 2008 she did a double relay crossing of the English Channel. * Sarah Outen, an adventurer by land and sea, rowed solo across the Indian Ocean in 2009, completed a mostly solo loop of the planet in her "London2London: Via the World" expedition. * Olly Hicks, a world record-breaking adventurer, endurance athlete and a highly regarded motivational speaker. His expeditions and voyages have taken him all over the world and to every continent & ocean. 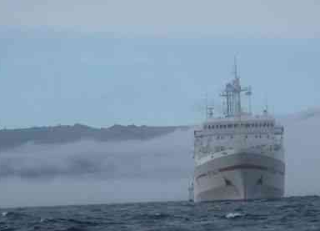 He has produced 2 award-winning documentaries about his record-breaking ocean voyages. He is also a serving member of the British Army Airborne Reserve. He is currently preparing an expedition to make the first solo row around the world beginning in December 2018. * Ian Couch, a Safety & Operations Manager for the Talisker Atlantic Challenge and has himself rowed the Atlantic twice, rowed the Indian Ocean, run the Gobi and crossed Greenland since 2008 and has 6 Guinness World Records for the rowing (including the first crossing of the Indian) and one British record for the fastest crossing of Greenland. * Dr. Nick Carter, a 'sometime doctor, sometime sailor’ with countless hours in polar water supporting the likes of Pen Hadow. Ocean Medicine accreditation is offered through the Royal College of Surgeons of Edinburgh. An estimated 24 hours of CPD will be awarded for the complete course. The course will combine lectures, interactive workshops both on land and at sea, reflective discussions and inspirational talks. Content will be intermingled with practical instruction and assessment for the RYA Powerboat Handling Level 2 qualification. * USA, Argentina, Bulgaria, Germany, Finland, Denmark, Belgium, Canada, New Zealand, Ireland, France, Italy, Estonia, Austria, Russia, Scotland, Wales, England, and South Africa.